The Cotswolds is a picturesque area of southern England, popular with both the British and visitors from all over the world. The beauty of the Cotswolds was recognised officially in 1966 when it was designated as an Area of Outstanding Natural Beauty (AONB). In 1990 the Cotswolds Area of Outstanding Natural Beauty was extended south towards Bath making it the largest area of outstanding natural beauty in Engalnd and Wales. 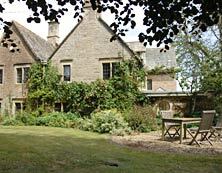 Luxury Cotswolds hotels, quality Cotswolds self catering cottages, Cotswold bed and breakfast and cosy Cotswold guest houses can all be found in the Cotswolds. As can plenty of camping and caravan sites. 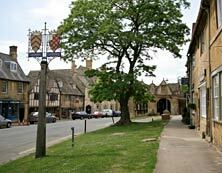 From villages such as Bibury and Bourton-on-the-Water, towns like Cirencester and Burford, and cities like Bath, the Cotswolds area of outstanding beauty in the UK has something for everyone. Whether it's a family day out at the Cotswold Wildlife Park near Burford, enjoying watersports at the Cotswold Water Park, or a walk through Westonbirt Arboretum, the Cotswolds has plenty to offer you. Find your way around the Cotswolds using our interactive map of the Cotswolds with clickable links to details of all the major towns and villages as well as motorway junctions for the M4 and M5. Blenheim Palace was designed by Nicholas Hawksmoor and Sir John Vanbrugh and on 30th November 1874 was the birthplace of Winston Churchill, Britain's World War II leader. The Cotswold Water Park is Britain's largest water park. Over 150 lakes created by gravel extraction, covering over 40 square miles - 50% larger than the Norfolk Broads and still growing. Bourton on the Water is often called "The Venice of the Cotswolds". Its many bridges span the shallow, crystal clear River Windrush which flows through the centre of the village alongside the main street. 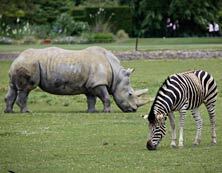 Renowned worldwide both for its tree and shrub collection and beautifully landscaped grounds. Today the collection contains around 18,000 trees and shrubs covering some 600 acres of Grade 1 Listed Landscape. Copyright (c) 2004-2015 CotswoldsWebsite.com / Commatic. All rights reserved.